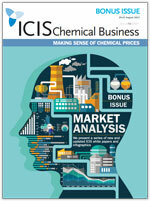 We are proud to present this special issue of ICIS Chemical Business containing a selection of new and updated ICIS white papers and infographics. These articles showcase some of best of ICIS editorial expertise from all geographic regions and cover many of the most important chemical value chains. We describe and analyze short, medium and long-term market trends with the help of static and interactive maps, graphs and diagrams.